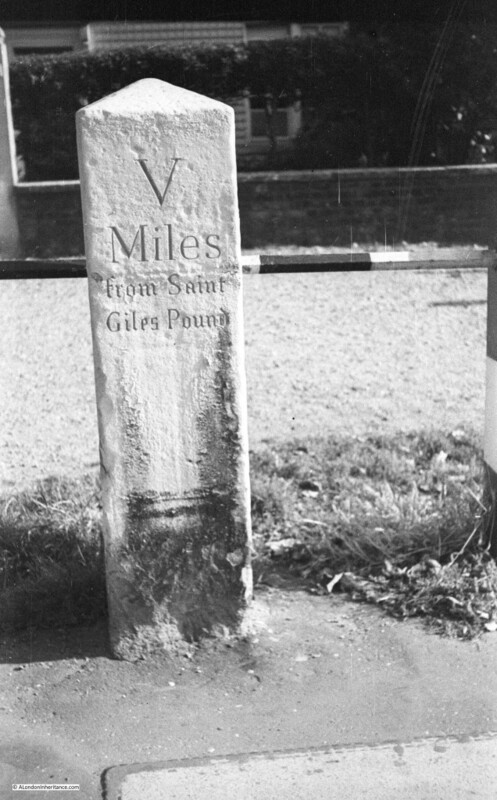 My father took this photo of a milestone in Highgate in 1948. It is just south of the Flask along Highgate West Hill. The milestone is still there as you can see in my photo of the milestone today. Nothing special you might think. 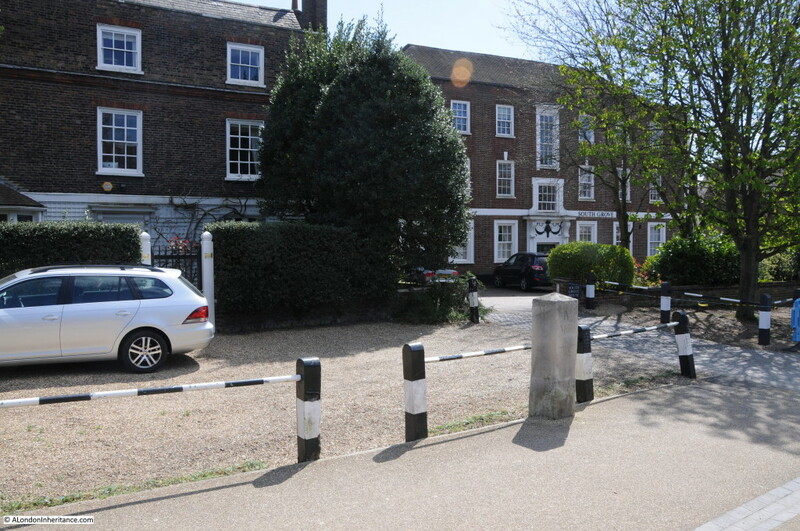 But compare the mileage, five in 1948 and four today – and the destination is a location that does not now exist in London, Saint Giles Pound. “‘The Pound’ probably existed from a very early period, as a necessary appendage to the parish while a village and abounding in pasture lands, though it is unnoticed in the books of the parish, till Lord Southampton’s grant of the ground on which it stood for the almshouses, where it is described as occupying a space of thirty feet, which was to be the dimensions of the new Pound, therein directed to be removed to the end of Tottenham Court Rd. The exact site of the Pound was the broad space where St. Giles High Street, Tottenham Court Rd, and Oxford St meet, where it stood within memory. Noticed for the profligacy of its inhabitants, the vicinity of this spot became proverbial: witness the couplet of an old song. 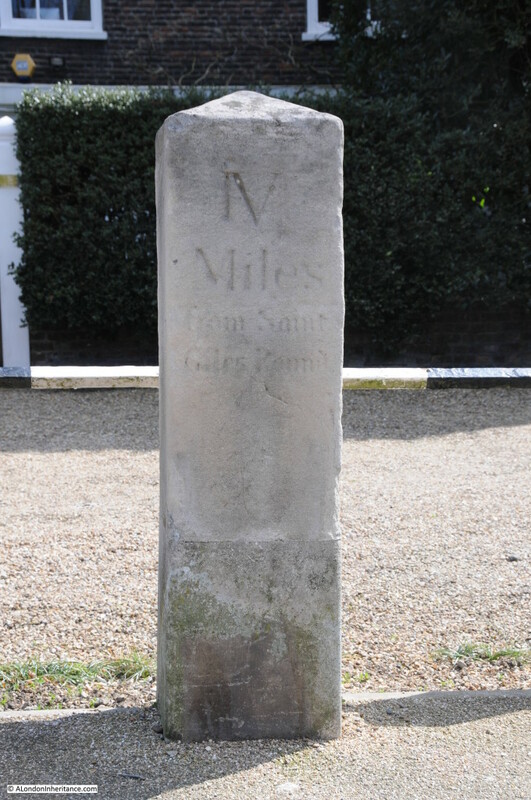 The milestone marks one of the old routes used to bring animals through Highgate and down into London. I wondered if the alteration of the distance upon the stone was made by a resident of Highgate who was frustrated with the error. But is four miles correct? 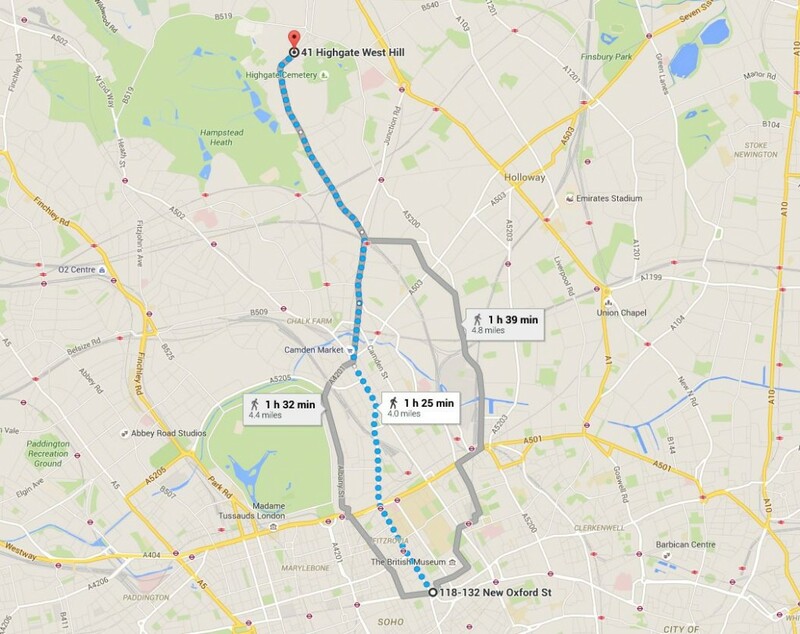 Although I have walked the route, I have not measured it, but Google maps confirms the distance as being exactly four miles. It would be interesting to know if the error originated when the milestone was originally installed or whether the figures have been recut and the error crept in then? They do look very sharp in the 1948 photo, with little deterioration to the edges of the lettering. 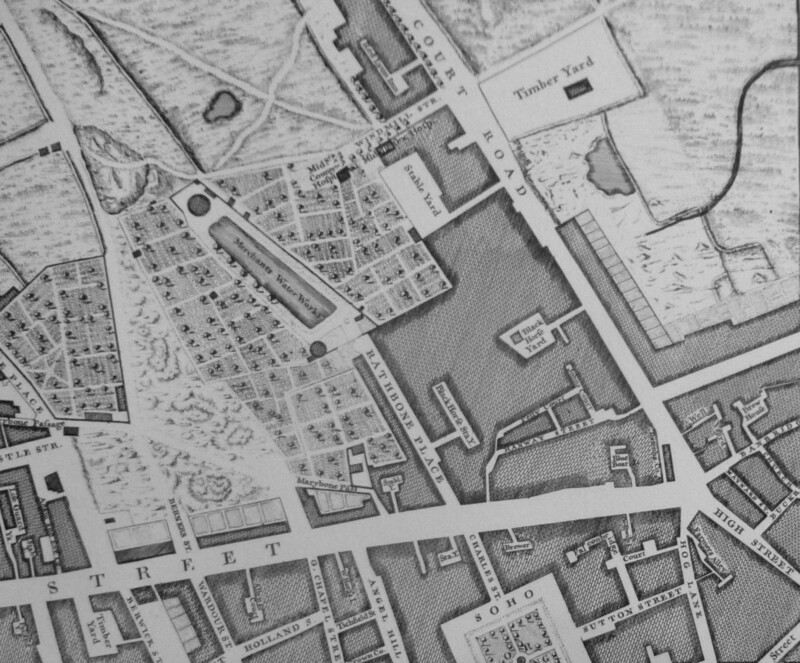 John Rocque’s Map of London 1746 was published nineteen years before the Pound was removed. In the bottom right, at the junction of Tottenham Court Rd, Oxford St and St Giles’ High St, there is a rectangular feature – could this be Saint Giles Pound? It is strange to think that – at this busy junction where the new Crossrail station is being built – once stood Saint Giles Pound, holding animals brought down from the north. Dear Readers, when I was in St Pancras & Islington Cemetery last week, I noticed a fox resting on a mossy mound in the late winter sunshine. The foxes here are truly wild creatures, apt to melt away into the undergrowth as soon as they see a human, so I was surprised to see this one in daylight. I am always delighted by the appearance of a fox, whether trotting up the street after opening the food-waste bins or here in the cemetery. But it was not until I got home and looked closely at my photographs that I realised that this particular fox has a problem. A quick glance at the fox’s rear end showed that he has a horrible case of sarcoptic mange. This is not unusual in town foxes and some veterinarians believe that it may be so prevalent because of the stress and poor nutrition to which urban animals are prone. Left untreated, it is likely to get worse. Sarcoptic mange (also known as scabies) is caused by a mite which burrows into the skin, causing hair-loss and irritation. The biting and scratching at the affected area may give rise to skin infection and encourages the mites to spread, which can ultimately be fatal. Foxes no longer eat or drink, and tear themselves apart, in trying to deal with the intense itching. This is an infernal parasite yet one which is all too common. If this was a fox that visited my garden, I might see if it could be trapped and treated with the pharmaceuticals that are normally used – Stronghold to kill the mites and a wide-spectrum antibiotic to sort out the infection. But no-one can set a trap on public land, where anything from the wrong fox to a cat to someone’s dog could be caught. Nor could I leave drugs around for the fox to find as they can be poisonous. Which brings me to homeopathy. I will admit to being a homeopathy sceptic. I find it difficult to believe that a solution so dilute that the active ingredient may be only a few molecules can be helpful. But I know that, with foxes, a homeopathic remedy (Arsenicum album and sulphur 30c) has proved to be efficacious in treating mange. It is completely harmless to other animals and can be used without concern even amongst pregnant or lactating animals. So, for the past few days, I have been trudging down to the cemetery and depositing a jam sandwich – cut into fifteen tiny pieces and containing exactly four drops of the homeopathic remedy – on the mossy knoll where I last saw the fox. Some days, it has been a bit of a wild and windy walk, with a huge hail storm on Wednesday and relentless drizzle on Thursday. Faced by all the human and animal tragedy in the world, I feel overwhelmed. I have no idea where to start. There is misery at home and abroad, and everything cries out for help. In the midst of all this, I feel helpless, useless. But this is one tiny thing that I can do. Will it work? Who can say? I know that every last scrap of the sandwich is eaten, yet whether by ‘my’ fox or some other creature I do not know. I believe there is something worthwhile in the act of witnessing, of noticing that a fellow creature is suffering and trying to help. Compassion is a muscle that has to be exercised and I know how easy it is for it to atrophy. I often feel so loaded down with my own worries that I am reluctant to take on even the smallest of someone else’s troubles. And yet, when I have finished writing this piece, I will put on my trainers and stride out through the mud in Coldfall Wood and onwards – a jam sandwich in my pocket – knowing full well that I am probably on a fool’s errand, but heading off just the same. This fox has crept in under my defences and looks at me with his amber eyes, challenging me not to look away. 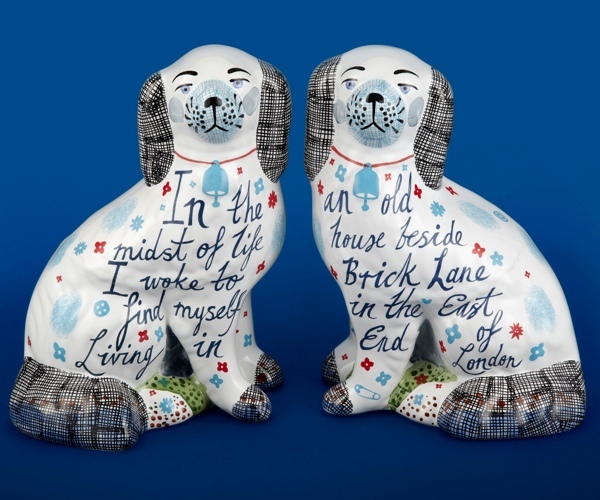 The course will be held at 5 Fournier St, Spitalfields on 14th & 15th May from 10am -5pm on Saturday and 11am-5pm on Sunday. Lunch will be catered by Leila’s Cafe of Arnold Circus and tea, coffee & cakes by the Townhouse are included within the course fee of £300. huge fan of Bug Woman, she has a Face Book page now. Nice to have such alumni! I so enjoy both of these blogs! Are The Gentle Author’s too, of course! I found ‘Jam Sandwiches in the Cemetery’ very moving. Thank you for posting. I started following your blog during a previous AtoZ Challenge. I save them all in my e-mail notifications. It is MY FAVORITE. Though I am always behind in reading your posts, the entire blog is the best. The clarity, the information front and center without a lot of messing around to have to navigate. It is uncluttered with other “stuff.” The subjects are always fascinating. Your work sets a high bar for bloggers. Visiting on the R day where I have written about a hotel in Rome for my hotel and inn theme this year. I picked the hotel for a second novel. Wish I were writing to you from there rather than North Carolina, but having fun, nonetheless. Thank you for your labor of love on this blog.